Why should sugar cookies only be made at Christmas? Sure, these melt-in-your mouth delights are associated with the holiday season, probably in part due to their colorful sprinkles or icing. But when I was a kid, we had sugar cookies for all sorts of seasons and holidays. Shamrocks on St. Patrick’s Day, leaves in the fall, bunnies at Easter, not to mention the host of fun cookie cutter shapes that weren’t holiday related that my mom would use for any-time treats. Granted, I don’t make sugar cookies as often as my mom did, but I am trying hard to make it happen more than just at Christmas. 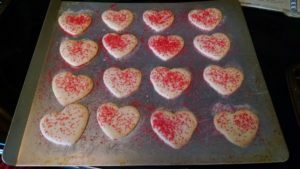 This week I baked a batch of Valentine’s Day cookies. Mostly for the kids to take to the retirement center for gift bags for church members, but of course, we kept some at home. And because I think we should all have fun with sugar cookies year-round, I’m taking this opportunity to share the recipe. What I love about this recipe is not only does it produces great sugar cookies, but that every time I pull it out of the cabinet, I’m flooded with memories. 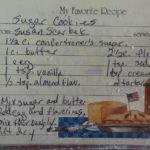 In these days of searching on the tablet for a recipe on Pinterest, it is meaningful to me that my favorite sugar cookie recipe is printed on a card that says “From: Susan Skarbek,” our neighbor from when my family lived in Marietta, GA. Susan was my mom’s friend and the mom of one of my best friends. It’s been more than 30 years since I lived in that neighborhood in the suburbs of Atlanta, but every time I use the recipe I remember playing Smurfs in the front yard or Barbies at the Skarbek’s house with Bethany and Jessica. So what makes this recipe the best? According to my mom, it’s that it uses only powdered sugar, not granulated sugar. The other trick to making it work? Patience. It seems like every time my mother shared her cookies with other people, they would ask her trick to rolling them out. I am here to tell you, this soft, sticky dough will be the bane of your existence, even after it has chilled three hours in the refrigerator. My mom’s tip was to use parchment paper, not waxed paper. I like to roll mine out straight on the sanitized granite counter top. But even with that, at least one roll out of dough will stick, and you just have to scrape it all up and start again. I’m here to tell you the effort and the frustration is totally worth it, these are some of the best cookies ever! To get you started, here’s the recipe. Cream the sugar and butter. Add egg and flavorings. Mix thoroughly. Sift dry ingredients together and blend into the butter/egg mixture. Refrigerate two to three hours. Heat oven to 375 degrees. Divide dough in half and roll 3/16” thick on lightly floured parchment paper. Cut with a cookie cutter and sprinkle with sugar. Place on a lightly greased baking sheet. Bake seven to eight minutes, or until just golden. I was all excited until you got to the part about rolling then out and then sticking. I’m not sure if I have the patience. Plus since I never make cookies that need to be cut out, I only own one cookie cutter. Maybe another day! It can be frustrating, but rewarding! The benefits of using parchment paper is when it sticks, you can just throw it all away. But then you want to have only rolled out a small part of the dough, not half! Hi Karen. Imagine my surprise when Alyson PM me that I was famous! Lol! So happy that my sugar cookie recipe is a favorite of yours. It certainly made a lot of kiddos in Russell Plantation happy! Wow! Lots of warm and wonderful memories of a special little neighborhood! 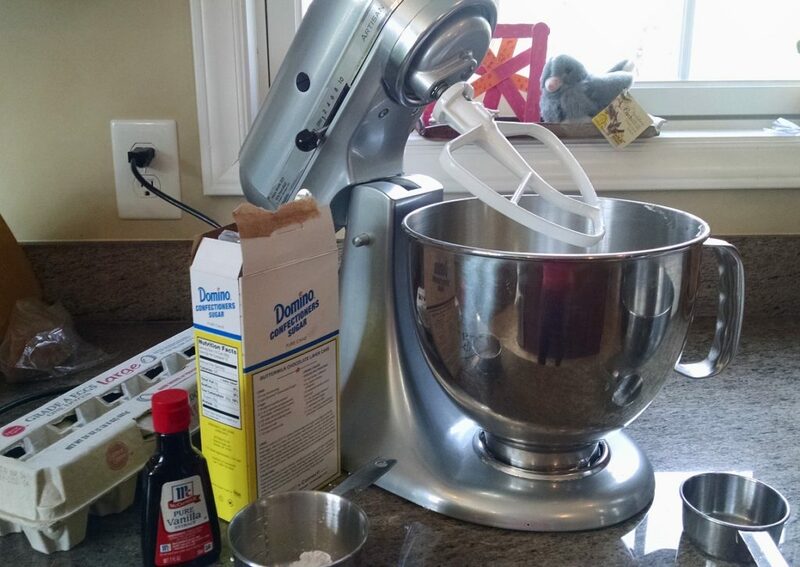 Your recipe has become a family tradition in our household too! We have great memories of that neighborhood. And it’s nice to have Facebook to reconnect in a small way.